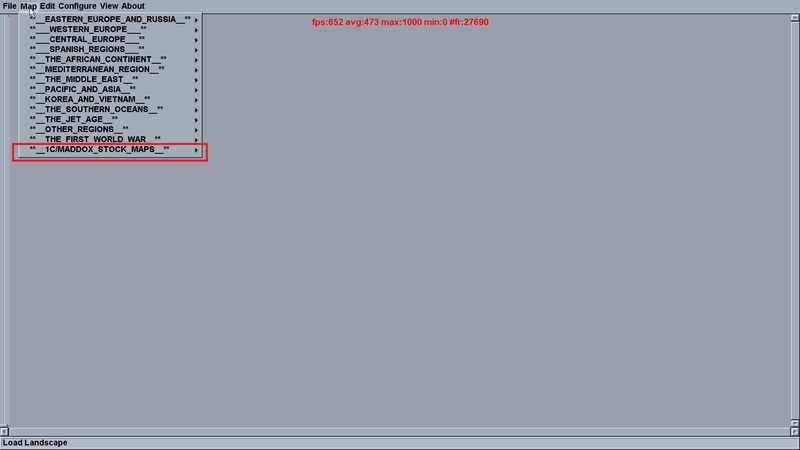 I noticed that even though some older missions with stock maps do run in single/qmb/online/campaign mode, if they are not a part of the IL-2 load (as in the Maps all.ini file), they cannot be loaded in the FMB. Although I like all the new content in BAT, to include the different eras, my attraction to IL-2 is fundamentally my obsession with WW2 military aviation. Don’t get me wrong, the WWI, between War and post WW2 stuff is amazing, but 92% of my time is spent on WAW. I like to keep things simple and find that having a quick way to use the Stock content is a necessity in mission building. 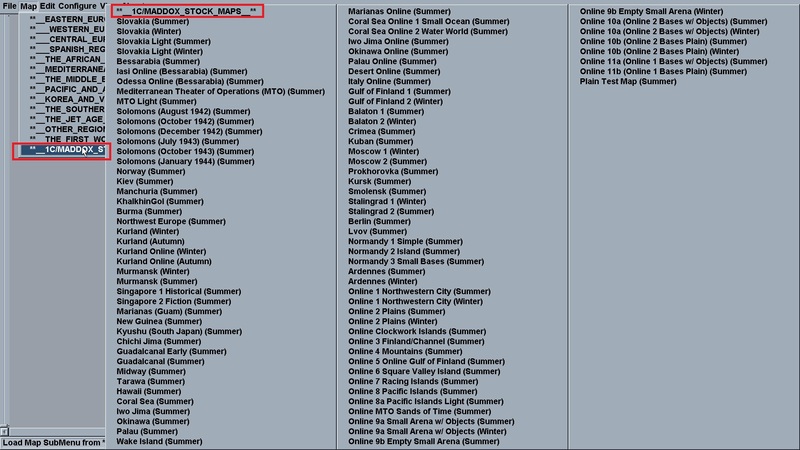 I simply added a Stock Map section in the FMB that contains all the Stock maps up to 4.12.2m with some simple description for each map. I decided to also include the Test map, which is really something to try new things (it is a square raised area in a barren area) when you do not want to deal with FPS-lowering stuff. All you have to do is download the file from the link below, unzip the folder inside the archive into the BATMODS folder and that is it. Not sure if this useful, but what a hey. Hey UD (UberDemon) you can PM with Vamp, He can Answer with you, but, Some Players are Confuse for Each map. But are sure for this. Got it, I provided Vamp with the list of missing maps from the BAT all.ini / MAPS.properties. Would it be an idea to split it even farther ie a folder "Online maps" to make it easier for off/onliners? I support the idea. Thanks UberDemon. Maps could also be presented in alphabetic order (B.A.T. + Stock), unless current order makes sense for reasons unknown to me. I only left it like that because that is the order in 4.12.2m, but it does not have to be. The order of the maps is decided in the "[ILl2 BAT install directory]\#WAW3\MAPMODS\Maps\all.ini" file. Like some ".properties" files, they are "nice to have" because they have nice text for us humans as opposed to file and code names. If the "[ILl2 BAT install directory]\#WAW3\MAPMODS\i18n\MAPS.properties" file has a text translation for the map code, then that it is what will display, but again, the order is decided in the all.ini file. It can be arranged in any way. On the other hand, repeating the code does not cost anything, so you could have multiple sections, say theater and stock, with some repeats, just as I added. Curious "mod", thanks for posting it. Tougth you departed, wish you could have keep the UQMG up to date with latest mods. It is hard to keep up with all the new mods. I am trying to overcome that with a neat mod that Storebror created for weapon codes, but it does not address all the new maps and other objects. In truth I am having a hard time making BAT work higher than a few FPS, so until then I'll concentrate on the stock version and the vanilla SAS ModAct.